As of 3/23/19 The Old Smokey Skate Park is CLOSED for repairs. Recent inspections have found large cracks in the asphalt surface which need to be repaired before the skate park can be opened. Estimates are being obtained from contractors to perform the work which will hopefully begin in min-to-late April. No one is allowed inside the fenced in area of the skate park while it is closed for repairs. A sign has been posted at the entrance to the skate park advising of the reason for the closure. Anyone found inside the fenced in area of the skate park while it is closed will be subject to arrest and fine for trespassing. When the skate park is open, users are reminded that it is open from 8:00am to Sunset (weather permitting). All Braidwood Park District grounds close at sunset 7 days a week. 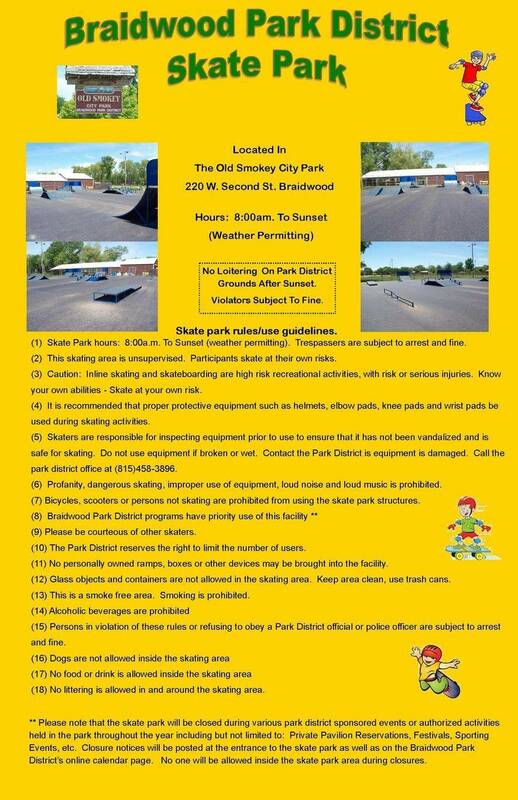 Please read the skate park rules and usage guidelines posted below. Have fun, be safe and please be courteous of others using the skate park and other park district amenities. The skate park may be closed from time to time to accommodate private pavilion reservations and other events taking place in the park. Any closure notices will be posted on the home page of this website.